July 29, 2013 by Ken Ward Jr.
Black lung has been the underlying or contributing cause of death of more than 76,000 miners since 1968, according to figures from the National Institute for Occupational Safety and Health. That total does not include deaths from silicosis, which is caused by breathing dust from rocks such as sandstone. Before the 1969 mine safety act, more than 40 percent of longtime miners in some regions of the United States got black lung, according to NIOSH data. 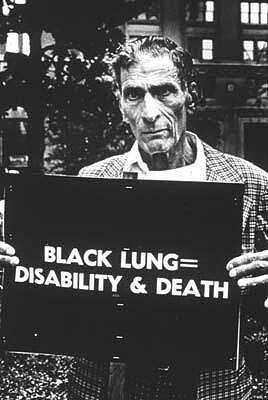 Overall, 11.2 percent of underground coal miners screened for black lung from 1970 to 1974 had the disease. Prevalence of black lung declined steadily for several decades, dropping to 2 percent in screenings conducted from 1995 to 1999, NIOSH said in a May 2011 report. Then, mysteriously, black lung rebounded. Screenings in 2005 and 2006 found the disease in 3.3 percent of surveyed miners. MSHA chief Joseph A. Main has said current rules are not adequate to protect miners. For instance: miners wear dust monitors for only eight hours, even though they might work longer shifts; companies can slow production to generate less dust when dust samples are taken; and MSHA uses an average of five samples to gauge compliance. The agency has proposed a number of changes, including lowering the limit on miners’ exposure to coal and silica dust; requiring miners to wear personal monitors to provide real-time dust readings; using a single, full-shift sample to measure compliance; and keeping production closer to normal levels while sampling. Of course, as we’ve reported — and as our work with NPR News and the Center for Public Integrity also explained — it’s been well know for a long time what sorts of actions could help to end black lung, but MSHA has under various political parties and leadership simply not put those reforms in place. And now, even with former coal miner and longtime United Mine Workers of America safety director Joe Main in charge at MSHA, reform regulations have been and remain stalled. When’s the last time you heard one of West Virginia’s political leaders or anyone from the Friends of Coal complain about the continued death toll from black lung?